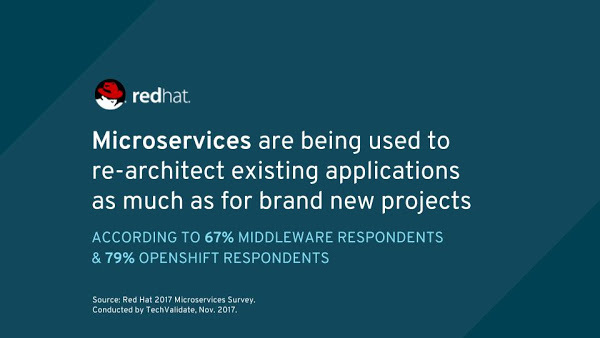 During the fall of 2017, we conducted a microservices survey with our Red Hat JBoss Middleware and Red Hat OpenShift customers. From this, we were able to discover how these customers are using microservices to their advantage, what they see as some of the major benefits, what challenges exist and how to overcome them and how microservices can give respondents a competitive advantage. 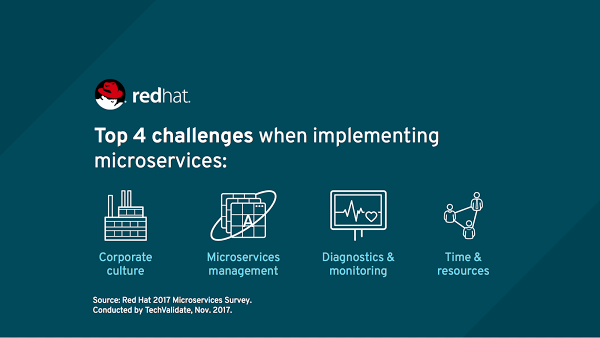 While these statistics are based off of a specific group of Red Hat customers, these findings give a good sense of the overall attitude toward microservices adoption and implementation. Read on to learn more about these findings. Microservices projects tend to be marketed as being best for implementing brand-new projects, without mentioning the benefits they bring to upgrading existing projects; however, the survey revealed that respondents are also using microservices to successfully re-architect existing and legacy applications. Sixty-nine (69) percent of respondents indicated that they are using microservices for both new applications and for re-architecting existing ones. Based on this data, it can be understood that microservices offers value to users throughout their IT transformations — from updating a current portfolio to introducing brand new initiatives. Through this survey, it became clear that there is no single runtime platform or framework that is the best for microservices. 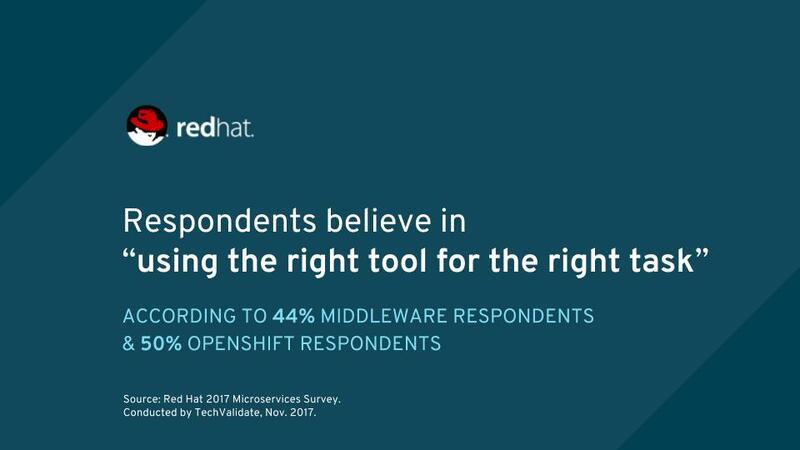 We also learned that 45 percent of respondents believe in "using the right tool for the right task," rather than dedicating themselves to a single technology, runtime or framework. 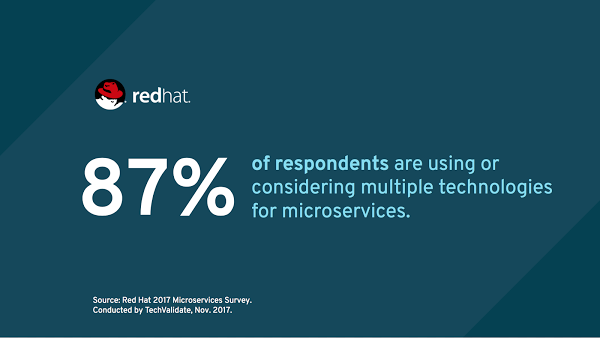 The survey also shows that 87 percent of respondents indicated that they are using or considering multiple technologies for developing microservices. These responses show that multi-technology solutions are becoming the norm and that more and more organizations simply want to use the right tool for the right task. This is why it is important to have multiple runtimes and frameworks, as not all technology projects function the same and most do not thrive on using the same tools. 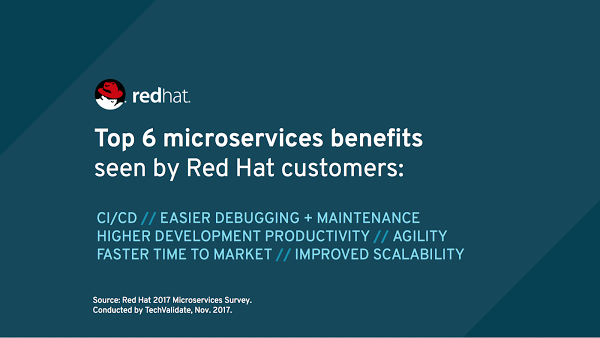 Furthermore, many (33 percent) of respondents recognized the benefits within two to six months of first implementing microservices, meaning that the ramp up time is a quick process and benefits can be observed very quickly. Respondents to the survey indicated that they have been relying on vendors as their trusted advisors when it comes to microservices. In addition, many responded that a reorganization was a mitigating activity to get past the microservices challenges in relation to corporate culture. This indicates that it is critical to have a plan in place to evaluate microservices solutions that are available in the market and do due diligence to select the one that best fits individual requirements. The reorganization of teams to incorporate new technologies and inspire change is also a recommended course of action. 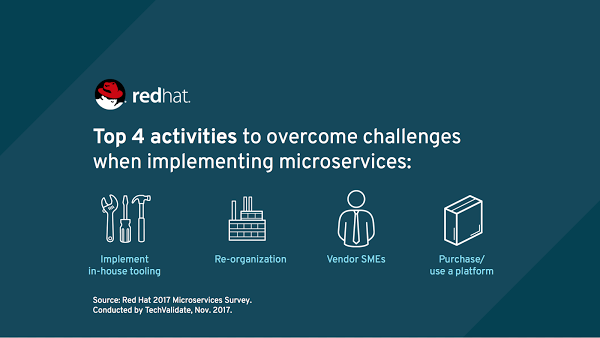 Introducing microservices can be disruptive to the way organizations are used to working; however, the results from this survey are promising. These respondents – and we would argue the industry at large – understand both the benefits and challenges of microservices, and are adapting their application strategies accordingly to better meet the demands of the new digital economy.